Ding, dong. Bing, bong. Carolers unite. Hear the bells, they are ringing, watch the children, they are singing. Deep in the recesses of the White House, the red trees have risen. Christmas in Hell is here. Are Christmas trees normally red? Did Satan’s fire make them so? What will the children think when they run through this cursed forest, brushing their soft hands against these burning bushes? 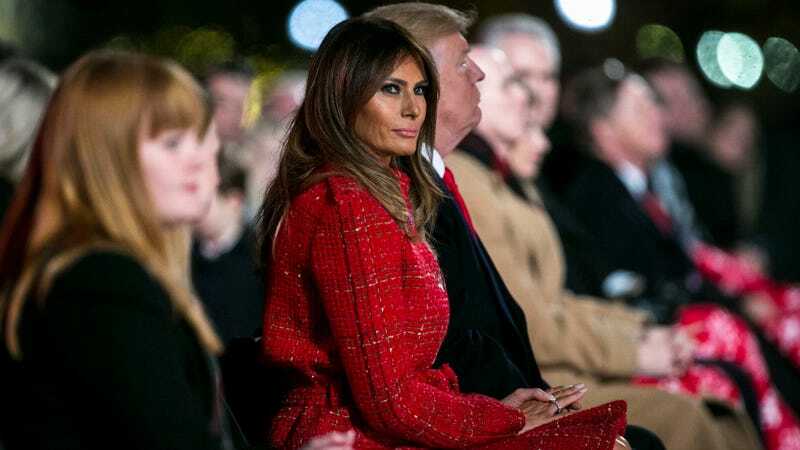 Melania tests her winter arm slowly, with the nervous confidence of a woman getting used to new sensations. Her bare hand sets the Douglas firs ablaze; she must keep the glove on, for now.